ANTI-SOCIAL behaviour in Annsborough has set alarm bells ringing. A spate of acts of vandalism at a wastewater treatment works in Annsborough could lead to a major environmental incident, NI Water has warned. To date NI water has said that the cost of the damage is around £100,000. South Down MP Margaret Ritchie said: “I condemn the despicable actions of vandals who have been responsible for attacking this waste water treatment works in County Down 24 times over the last 12 months. “These vandals have shown a total disregard for the local community and the plant in Annsborough which is responsible for treating raw sewage from 2,100 properties in Castlewellan and Annsborough. 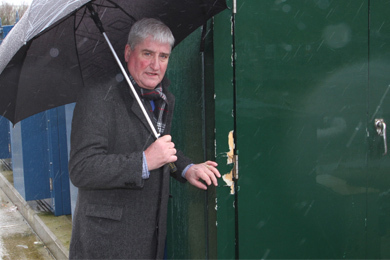 At Annsborough WWtW, Councillor Eamonn O’Neill examines an outside storage unit that was forced open and its equipment was smashed. An estimated Â£100,000 worth of damge has been caused to date. Newcastle area SDLP Councillor Eamonn ONeill has also responded saying he is “appalled” at the damage done to the treatment works. He said: “I just find it unbelievable that there were 24 separate attacks on this vital installation which services around 2100 properties in the area. This looks like more than wanton vandalism… and more like a systematic campaign! “This provision was hard fought for and badly needed to cope with the demands of our growing community especially with a big local increase in housing. When we had the old system on that site there were constant problems with overflowing and leakage and at the time I made strong representations for upgrading. “Now that we have, it is appalling that it has been so vandalised. There is also the huge risk to pollution from any of these actions. This could be disastrous for the health of the Leitrim River which was badly abused in the past and has been gradually being restored. I am also quite sure that the cost of the damge around £100,000 could be used more usefully. The WWtW site holds much computerised equipment and electrical panels etc and the perpetrators of the damage had simply levered open an outside cabinet and damaged panels, smashed a door open then wrecking a computer and several other expensive items of equipment. Northern Ireland Water are deeply concerned about the damage and may even yet contemplate having a night securityman on site to curb the attacks to the effluent treatment works. Down News understands that there have been complaints made to Down District Council’s Environmental Health Department regarding noise from the new WWtW site following its redevelopment and a spokesperson from the Council said that there was no further action that could be taken. Apart from this spate of vandalism, there appears to be not other acts directed at the Annsborough WWtW. Alec McQuillan, Head of Wastewater at NI Water, explained: “These incidents have been going on for about a year and have resulted in considerable expense and disruption. Almost £100,000 has been spent repairing damaged equipment, introducing increased security and installing new equipment at the site. “That expense creates a drain on limited resources, and means that other priority improvements to our services cannot be delivered. However, what worries us more is the potential for a major pollution incident to occur as a result of the damage being caused. “This area has a well-deserved reputation for the beauty of the waterways and coastline and we, as a company, view the protection of that environment as a major priority. It is for this reason that we are particularly concerned about the potential that these attacks have to cause a significant incident. “We have been working closely with the PSNI and have increased our own staffing levels at the site in an effort to apprehend those responsible, but so far without success. Chief Inspector Deirdre Bones, PSNI Area Commander for Down, commented, “Those carrying out these senseless acts of vandalism are putting themselves in danger and putting the whole community at risk of a potentially serious pollution incident. I would appeal to whoever is responsible for these attacks to stop now before even more serious damage is caused.